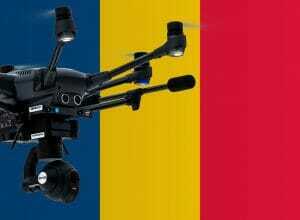 Learn all about the drone rules in Romania on that page. For a drone to be allowed flying legally in the Romanian airspace, it must be registered as an ultra-light aircraft with a take-off weight of more than 500 grams. Of course, Romania’s air traffic control is responsible for this. However, documents from foreign aviation authorities are sometimes accepted. So you can mail the Authorization from your country to the Authoritata Aeronautica Civila Romana (AACR) and then the requirement is fulfilled. The regular registration process costs 90 Euro plus VAT. Unfortunately, registration is not enough to fly with the drone in Romania. All flights must be notified in advance to the Ministry of Defense with location and time. Therefore I would recommend traveling only with drones to Romania weighing less than 500 grams (e.g., DJI Spark or the Yuneec Breeze). Maximum flight altitude: In Romania, your drone cannot fly higher than 300 meters. Maximum horizontal distance and FPV: The visible contact with the drone must exist in Romania during the flight. The distance between the operator and the drone may not exceed 300 meters. Compulsory insurance: For operation in Romania, you must complete drone insurance when your drone weights more than 20kg. Maximum take-off weight (MTOW): From a take-off weight of more than 500 grams, you must register your multicopter (see above). Distance to airports: No information found. Other safe distances: No information found. Flight bans: Flights with unmanned aerial vehicles may only be carried out outside of cities. The Romanian CAA may grant individual authorizations. A drone cannot fly over crowds. Flight approval: For operations in the biosphere reserve “Danube Delta” an overflight permit is required. Time of operations: No information found. Specific regulations: The Ministry of Defense must release all drone flights in Romania. Regulations for commercial pilots: As far as I know, there is no division between leisure drones and commercial multicopters in Romania. We have researched the listed drone regulations for Romania to the best of our knowledge. We can not guarantee the correctness of the information. If you want to be on the safe side, please contact the competent aviation authority. Alternatively, you can also ask the embassy in your country for further information about the regulations. Please leave us a comment when you receive news and/or gain experience with your copter in Romania! If the drone’s takeoff weight is less then 500g and you don’t use the drone to take aerial footage then you don’t need any special permissions and you don’t need to register the drone. If the drone’s takeoff weight is between 500g and 15kg then you need to register the drone with CAA. Drones that weigh more then 15kg require a licence. Drones that weigh more then 20kg also require a liability insurance. If you would like to use the drone to take aerial footage then you need a special permission from MApN (Romanian Ministry of National Defence). It is illegal to fly a drone FPV without a licence. According to caa.ro the maximum altitude for a drone is 300m. The pilot needs to have the drone in sight at all times and the distance between the pilot and the drone should not exeed 300m. It is illegal to takeoff or land a drone in cities or towns, it’s illegal to fly above crowds without a special permission and it’s illegal to fly near airports, military bases, prisons and some other public buildings. To register a drone that weighs between 0.5 and 15kg will cost 90€+VAT and the process will take up to three weeks. This can only be done in Bucharest and you will have to leave the drone with CAA for the whole period so they can fit a chip and put a registration number on it. For drones that weigh between 15kg and 150kg the fee is 540 euro plus VAT for the flight permit for one year and after that the renewal is 300 euros plus VAT. hey do you have messenger to chat about drone flying in Romania? If my drone weighs < 500g can I take flight with it? I understand that I don't need a licence but what does "aerial footage" mean? Whats that height? Most probably by now you have found the answers to your questions, but I will answer them anyway just in case somebody else has similar queries. I’m not a regular on this website and I’ve stumbled across this article again looking for something else so I apologise for the late response. As your drone weight is less then 500g you don’t need to register it and you don’t need any special permissions from the Civil Aviation Authority. The “hight” should not be more then 300m. That is the distance between your drone and the ground underneath it. In most of the other EU countries that hight is 120m or 400ft and if you have a DJI drone it will be set to 120m by default. If you are flying your drone off a cliff, mountain or something similar you will have to be extra careful not to exceed the hight limit because the drone will tell you the hight between it and the point it took off and not the actual hight between it and the ground below it. Aerial footage is any picture or video taken from something that flies (drone, helicopter airplane etc). 1 DO NOT fly more than 300m above the ground as you will be putting helicopters and low flying airplanes in danger. 3 As tempting as it might be, please don’t fly too close or over historical sites. Some of them will have signs that clearly say NO DRONES ALLOWED but some of them won’t. 4 When flying, try to attract as little attention as possible. Find a quiet place, away from peoples view from where you can take off/ land and fly without being disturbed. Some people don’t know much about drones and they can easily get paranoid about them. 5 If you see the police then please don’t fly anywhere near them. Unfortunately like in many other countries, most of the police officers have limited knowledge about drones and regulations so it is better to stay away from them. It’s better to be safe then sorry and it will save you a lot of time trying to explain to them that what you are doing is perfectly legal. 6 DO NOT fly near or above crowded areas where you have a lot of people together. Use your common sense and think that if you have to do an emergency landing can you do it safely without hurting anybody. 7 Do not worry too much about asking for permission from MApN (The Ministry of Defense) to take pictures or videos with your drone. Most probably if you will call them to ask for permission to film with your drone, they will hang up on you thinking that you are making fun of them. As long as you don’t try to take pictures of some military stuff they won’t care. 8 Do not loose track of your drone. The law says that you can fly up to 300m away from you but in some cases, depending on the drone size, colour, your eye sight, you will loose track of your drone much sooner so please don’t push it all the way to 300m because that’s what the law says. If you follow this 8 tips then you shouldn’t have any problems flying a drone in Romania. Stay safe and happy flying. Of course have communist laws regarding drones, compared to other EU countries. It is like this because Dragnea&Co are afraid of the eyes in the skies, because those might show to the world what you cannot see from the ground level(their villas, illegal destroying of forests and natural areas etc). Welcome back to the communism, Romania!